AG Consulting Partners is honored to announce the recent recognition for our incredible growth. On October 25th, Consulting Magazine ranked AG Consulting Partners as the 18th Fastest Growing Firm, moving up 17 places from 2017. 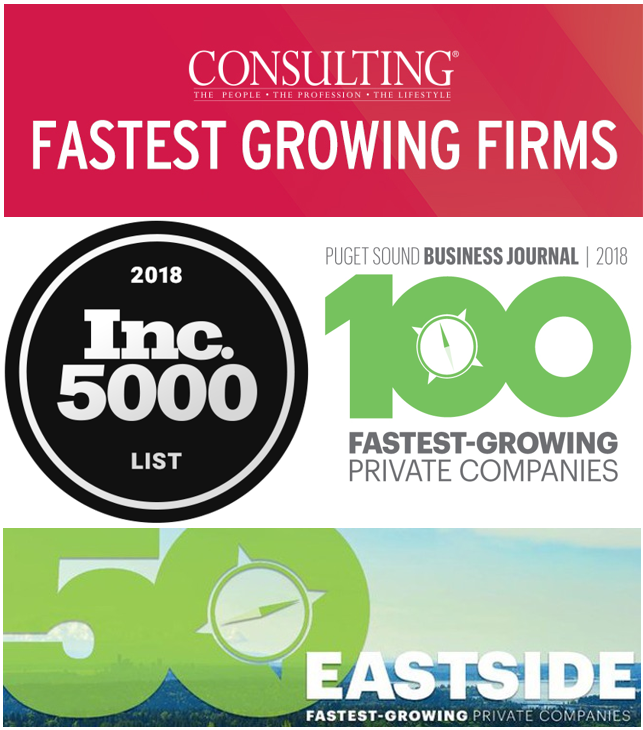 In 2018, AG Consulting Partners was ranked as the 5th Fastest Growing Private Company on the Eastside and the 14th Fastest Growing Private Company in Washington State by Puget Sound Business Journal. Inc. Magazine placed AG Consulting Partners #2,049 on America’s 5000 Fastest-Growing Companies list. We are truly proud of what we have achieved in just nine short years. The dedication of our employees to their clients and to their craft is shaking up the consulting industry. We’re just getting started and we’re thrilled to see where the future will take us!